ODESSA, Ukraine -- The grim, Soviet-era concrete block that houses the regional government here has sprouted an unlikely appendage: an airy glass box crammed with gleaming new workstations and a team of lawyers. 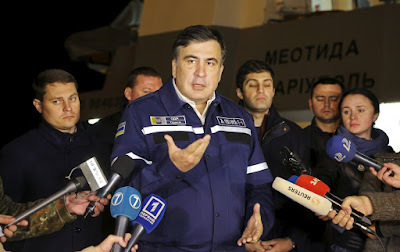 Governor Mikheil Saakashvili near Odessa, Ukraine, on Oct. 17, 2015. Its purpose is to field the complaints of the deeply frustrated people of this historic Black Sea port, which belongs to Ukraine but which Vladi­mir Putin considers a rightful part of Russia. In its first three weeks, it was swamped with 3,500 cases. The author of this experiment in responsive government is a still more unlikely figure: Mikheil Saakashvili, the revolutionary-turned-president of Georgia, whose decade-long drive to consolidate a pro-Western regime in that former Soviet republic made him the nemesis of Putin and a polarizing figure in Western capitals. Driven out of Georgia after a lost election, Saakashvili has installed himself and a multinational team in the middle of Ukraine’s turbulent effort to fend off Putin’s military invasion and create an economy and political system purged of Putin’s corrupt authoritarianism. That struggle appears to be reaching a tipping point. Ukraine’s pro-Western leaders seem confident they have, for now, blunted Putin’s bid to capture by force the territory he calls “Novorossiya,” including Odessa and much of the rest of southeastern Ukraine. They seem to have stabilized the economy. But their attempt to free the country from the grip of Russian-style oligarchs and endemic thievery is making halting progress, at best. Western governments that have, barely, kept the country financially afloat are growing impatient. So are Ukrainians, who are telling pollsters they are ready to repeat the street revolution that ousted the previous, pro-Putin government. Saakashvili and his cadre have provided some of the few visible signs of progress. One Georgian has created entirely new police forces for Odessa and Kiev; another is helping to create an anti-corruption agency. In Odessa, the revamping of public administration is being overseen by Maria Gaidar, a prominent Russian opposition activist (and daughter of Boris Yeltsin’s reformist prime minister) who concluded that the best way to fight Putinism was to help build an alternative in Ukraine. Saakashvili, however, is far from satisfied. On the contrary: Over a dinner of salads and grilled meats with a delegation I joined from the German Marshall Fund last week, he repeatedly warned that Ukraine was on the brink of another meltdown. “Ukraine defeated Russia militarily,” he declared. Like most people in Kiev, Saakashvili is less focused on the 40,000-man army Putin still keeps in eastern Ukraine, where a shaky cease-fire prevails, than on the political battles of Petro Poroshenko, the businessman-turned-president who befriended Saakashvili decades ago when they were students in Kiev, and invited him back to the country last year. Dependent on a fractious parliamentary alliance, Poroshenko has struggled to pass reform measures demanded by the European Union in exchange for trade and visa concessions — such as an anti-discrimination measure protecting gay rights that was rejected several times before finally winning approval last week. Meanwhile, Poroshenko has shrunk from a full-scale assault on the oligarchs and corrupt civil service. Only a handful of Ukraine’s 8,000 judges have been removed, though thousands are known to be corrupt. The president has infuriated Western officials by refusing to replace the prosecutor general, who has been blocking key investigations, and by maneuvering to control the appointment of an anti-corruption prosecutor, without whom the new anti-corruption agency can’t begin operating. EU officials seem to hope that Poroshenko and Prime Minister Arseniy Yatsenyuk can be slowly and painstakingly pushed into further reforms. Saakashvili, clearly not content to limit his attention to Odessa, has another idea: a radical government shake-up. “The way out of this is that we should have a reset of government,” he says. “We have to realize the depth of Ukraine’s corruption,” he said. The new complaints center in Odessa, and an adjacent “public services center,” are meant as pilot projects to model a nationwide transformation. Few in Ukraine dispute Saakashvili’s analysis. In fact, there is talk in political circles that he could or should somehow be installed as prime minister. Saakashvili denies that that is what he means in calling for a shake-up; he points out, correctly, that he lacks a political base in the parliament. The government’s Western minders sound horrified by the idea. Yet if Ukraine is to win its war against itself, something here clearly needs to change — and soon.